In 2017, Memphis rockers TORA TORA were approached by Frontiers Music Srl about recording a proper new studio album and they enthusiastically jumped at the opportunity. The resulting new album, Bastards Of Beale, set for release on February 22nd, brings back the magic of the band’s blues-rooted hard rock sound that gained them a loyal following upon their debut in the late ‘80s. Always a far cry from their more polished mainstream peers and more spiritually connected to blue collar hard rock, the band’s return picks up where they left off, while not sounding even the slightest bit dated. 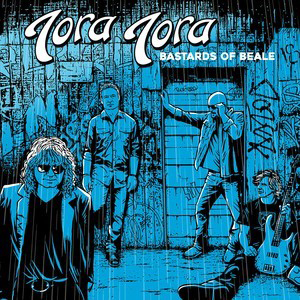 TORA TORA is an American hard rock band formed in Memphis, Tennessee in the ‘80s. The origin of the band name is a reference to the song of the same name released by VAN HALEN on their 1980 classic, Women and Children First. The band got their start toughing it out in the local Memphis scene before they won a local Battle of the Bands contest that landed them some free studio time. Following this, the band recorded To Rock To Roll, an independently released EP. After signing with A&M Records, they recorded their debut album Surprise Attack in 1989. The album charted on Billboard’s Top 200 at No. 47 and featured the singles “Walkin’ Shoes” and “Guilty”. The single “Dancing With a Gypsy” was on the soundtrack for the hugely popular film Bill and Ted’s Excellent Adventure later that year. In 2008, all four original members reunited for some performances. One was a sold-out performance at Newby’s, a local club in Memphis, to celebrate the 20th anniversary of receiving their major label recording contract. The second appearance occurred during Rocklahoma 2008 before the band played another reunion show at The New Daisy Theatre on March 7, 2009 in Memphis. Since the reunion, TORA TORA has released three albums of unreleased material, Before & After, Bombs Away: The Unreleased Surprise Attack Recordings, and Miss B. Haven’: The Unreleased Wild America Recordings. But fans were clamoring for NEW MUSIC from the band, and that is just what they will get with the release of Bastards of Beale! Check out the band's PledgeMusic campagin right HERE as well as a brand new track, "Rose Of Jericho", streaming below. "Son Of A Prodigal Son"